This podcast will feature a single thought per episode covering a wide range of topics. Episode length will be no longer than 20 minutes! I swear, this is the last episode I will talk about my surgery! So, I forgot all my passwords... and I am pretty sure anesthesia is why! Listen to how it all went down, how I am coping with it and where I go from here! 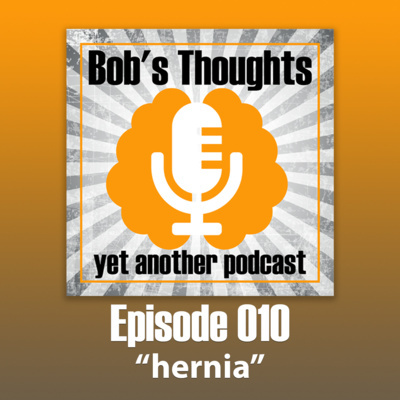 So, I had my hernia surgery a couple weeks ago... kinda explains (only kinda) why I have not uploaded an episode in a while. I am on the mend, and I will be posting much more regularly again. So, I share a little bit about my recovery to date in this episode. Feel free to hit me up on https://twitter.com/bootnumlock and let me know your thoughts... on my thoughts. Thanks for listening. If you are on apple podcasts, please consider leaving a review and some stars - much appreciated. Today on Bob's Thoughts I talk about an episode that impacted me about 20 years ago and how it has had me thinking about memory loss ever since. I would love to hear your thoughts on my thoughts, so hit me up on twitter (@bootnumlock) and tell me what you think! Today, I talk about how the mere power of suggestion can create a negative or nocebo effect and how it can be countered by a placebo effect or positive thoughts in our daily lives... of course, I reference my resent hernia injury as the basis for the thought. Hit me up on https://twitter.com/bootnumlock and let me know your thoughts on my thoughts! So we have been talking about ego a bit around our house lately - and in this episode I talk about how my ego may have hindered my professional growth this past year. Give it a listen! Today, I talk about fear on Bob's Thoughts - not the scary movie kind of fear, but the kind that changes the paths we take in life... or attempts to change those paths. Give it a listen and let me know what you think - find me on twitter @bootnumlock and leave me a note about your thoughts on my thoughts! Our ability to zoom in an zoom out to see the big picture - that is the topic for this episode. It is on the shorter side.... so enjoy! In episode 4 my thought is about my own mortality. There was a recent event that I discuss and tie in how I feel about my own mortality. I discuss how we decide to deal with these thoughts has an impact on how we live our lives moving forward. Would love to hear your thoughts on my thoughts... send me a message on twitter - @bootnumlock or send me an email bob@baty-barr.com! My thought today is about my time in and around martial arts and how it can be a wonderful experience to help build confidence, physical and emotional stamina and how it is just a great experience for any age! So, in this episode I revisit a common thought of mine about (work-life) balance. About how it isn't a destination, but fractions of moments in time that we are always trying to get to. Listen in for a brief bit and let me know what you think! So, this is the pilot episode, but also my first thought for the podcast. On this episode, I talk about my thoughts on my float tank experiences. Give it a listen and let me know what you think!